How many sent e-mails were read or clicked? Which were the most clicked links? This is the basic information all e-mail marketers need to verify in order to understand the effectiveness of their e-mail marketing campaigns. TrackReports has the answer! Trackreports is our free on-line service for monitoring in real time your e-mail campaigns. It’s fully integrated with SendBlaster’s interface, so when composing your message you only need to insert a special link into the message by pressing a key. When your recipients open your e-mail or click on a link, TrackReports updates its database and creates both textual and graphic based statistics. What kind of data does TrackReports analyze? Read and clicked e-mails: data refers to opened email messages only, and show how many of them were just read but not clicked and how many of them were clicked. Views and clicks: each one of your emailings will have its own unique ROI rate, views and clicks data. Looking at views data we understand when one of our emailings got read more than once per each single reader. 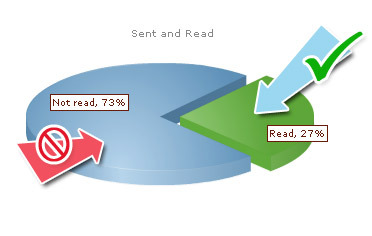 Unique clicks: we know the exact number of people that read our emails. Knowing the emailing’s unique clicks will be mandatory to understand the emailing’s ROI. Repeated clicks: a repeated click on one of our email marketing email messages illustrates a user’s interest rate in what we are talking about in our emailings and will help us understand which are the best subjects, styles and ways to compose our next email marketing campaigns. E-mail contacts tracking: It shows who opened your email message and who clicked on the links.